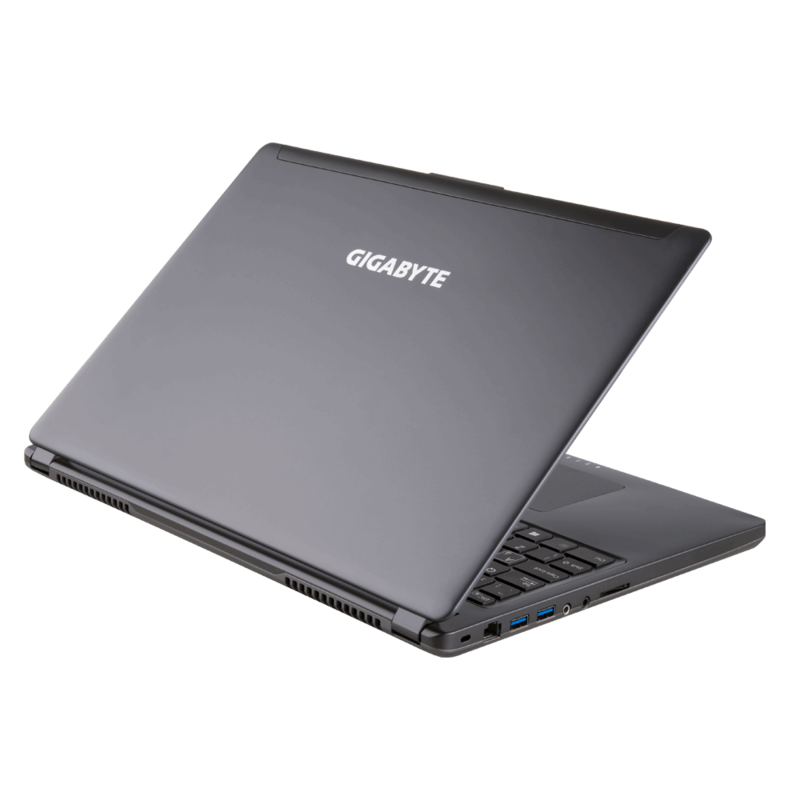 The P35X is Gigabyte’s best laptop, a 15-inch machine that tucks an impressive amount of firepower into a svelte frame. Today, we’re looking at the latest iteration, version 5, which adds Intel’s sixth-generation processors, USB Type-C and DDR4 RAM. Time for a design refresh? The Gigabyte P35X v5 is the best 15-inch laptop that Gigabyte have produced yet, but that’s no surprise. The inclusion of modern standards like HDMI 2.0 and USB Type-C make this laptop future-ready, although the new sixth-generation CPU is slightly less powerful than its predecessor. Perhaps after five iterations the P35X deserves a design refresh. The Gigabyte P35X v5 offers the same design as its predecessors, with a slim black build, a full-size keyboard, generous trackpad and ports on the left and right sides. There is an option for a 1080p or 4K display; our review unit has the 1080p display. The only difference compared to the version 4 model we looked at last time is the port configuration on the right hand side. We have HDMI 2.0 replacing HDMI 1.4, and USB 3.1 Type-C replacing one USB 3.0 port. For more on the Gigabyte P35X’s design, please see our review of the P35X v4. In order to best examine the difference in performance from one generation to the next, we’ll be keeping a similar testing methodology that we used on the last P35 laptop we examined. Additional tests will also be performed in the recently released XCOM 2, alongside traditional benchmark games Total War: Rome 2, Bioshock Infinite, Company of Heroes 2 and Metro: Last Light. The P35X v5 is a sleek and stylish laptop no doubt, but how does it actually perform? As a work machine, the P35X is an absolute pleasure. The new PCI-e solid state drive makes everything incredibly rapid — starting up Windows 10, launching programs, working in Photoshop — and there’s more than enough horsepower here for image and video editing too. Gaming machines are often good workhorses, and when combined into a light and slim laptop, it’s pretty excellent for getting things done wherever you are. The new processor is a little more power efficient than its predecessor, and that translates into slightly better battery life. You can get about six or seven hours with minimal use (just writing at lower screen brightness settings), but more usual work will shrink that number down to four or five. The P35X also has a nice keyboard; a little shallow perhaps but with reasonable action and a sensible layout. Combined with a good-size trackpad, and you’re left with solid input options that finish off a great work PC. So the P35X is a good work PC, but we don’t really care about that. How good is this laptop for gaming? Well, it’s a mixed bag. The lower-turbo-clocked processor does allow for better battery life, but makes for a slightly weaker top-end, which translates into lower FPS in-game. We noticed around a 10% drop in FPS compared to its predecessor, which is disappointing given the upgrade to DDR4 and the same great GTX 980M graphics card. The v4 was already a very strong gaming laptop though, so you’re still left with enough performance for mid to high settings at 1080p; only the most recent titles will really cause you to drop your detail settings down further. For games like Counter-Strike or League of Legends, you’ll still be able to easily hit competitive frame rates. Otherwise, the v5 is pretty strong. The backlit keyboard works well enough for gaming and the 1080p screen resolution is a sensible choice given the horsepower available. It would have been nice to see better performance from the new CPU, but you can always get the v4 laptop if you want maximum performance. The P35X v5 is quite similar to the v4, so you may wish to see our earlier review for additional impressions. 3DMark is our first test, and unfortunately we see a slight performance regression compared to the earlier P35X v4. The v5’s new 6700HQ processor operates at a lower TDP and has a lower turbo clock (when operating in dual or quad-core mode) compared to the 5700HQ it replaces, and it looks like that has had a fairly noticeable effect on performance, despite the jump from DDR3 to DDR4. Once again, we see disappointing Cinebench results for the P35X series, even compared to older laptops. The v5 is again worse than the v4, which is a pretty bad sign. Here’s one place the v5 model is miles better than its predecessor: storage performance. Thanks to the new PCI-e storage solution, we’re looking at remarkably good speeds, only rivalled by the U506’s higher-grade PCI-e drive. The difference between the v5 and v4 is night and day; about four times faster in the sequential tests. The P35X v5 turns in our worst GeekBench multi-core performance in a long time, likely thanks to that lower turbo clock in multi-core mode. BioShock Infinite is a fairly easy target, and we expect to see easily in excess of 60 fps here. Indeed, we see that the v5 is pretty close to the v4, within ~10%. So we’re not seeing better speeds, but at least they’re in a similar ballpark. Company of Heroes 2 relies a little more on CPU performance, and doesn’t benefit from multiple GPUs. Despite this, the P35X v5 turns in a good performance, beating even its predecessor by a single frame per second. Anywhere near 60 fps in the benchmark ensures a highly playable game, so this is a reasonable result. Metro Last Light is again a harder target, but the P35X acquits itself well with the second-highest score we’ve seen thus far, easily hitting that 60 fps target. Our final test is Total War: Rome 2 at demanding Ultra settings. The P35X v5 does well here, but still lags behind its predecessor by about 8%. That’s been a trend throughout these tests, and does suggest that the P35X v4 is a better choice if you’re looking for raw in-game performance. The Gigabyte P35X v5 is a modern, refined version of the P35X formula: excellent performance and strong fundamentals packed into a sleek package. While the performance regression compared to the v4 is regrettable, the increase in storage speed, new port options and improved battery life make it a solid choice.